For the uninitiated, when economists refer to FX, the abbreviation doesn't mean "special effects" or "Federal Express" or "Fighter, Experimental." It means "foreign exchange." Morten Bech discussed "FX volume during the financial crisis and now" in the March 2012 issue of the BIS Quarterly Review. BIS stands for Bank of International Settlements, an organization whose members are central banks and some international organizations, which among other tasks holds conferences, collects data, and facilitates some financial transactions. "By applying a technique known as benchmarking to the different sources on FX activity, I produce a monthly time series that is comparable to the headline numbers from the Triennial going back to 2004. Taking stock of FX activity during the financial crisis and now I estimate that in October 2011 daily average turnover was roughly $4.7 trillion based on the latest round of FX committee surveys. Moreover, I find that FX activity may have reached $5 trillion per day prior to that month but is likely to have fallen considerably into early 2012. Furthermore, I show that FX activity continued to grow during the first year of the financial crisis that erupted in mid-2007, reaching a peak of just below $4.5 trillion a day in September 2008. However, in the aftermath of the Lehman Brothers bankruptcy, activity fell substantially, to almost as low as $3 trillion a day in April 2009, and it did not return to its previous peak until the beginning of 2011. 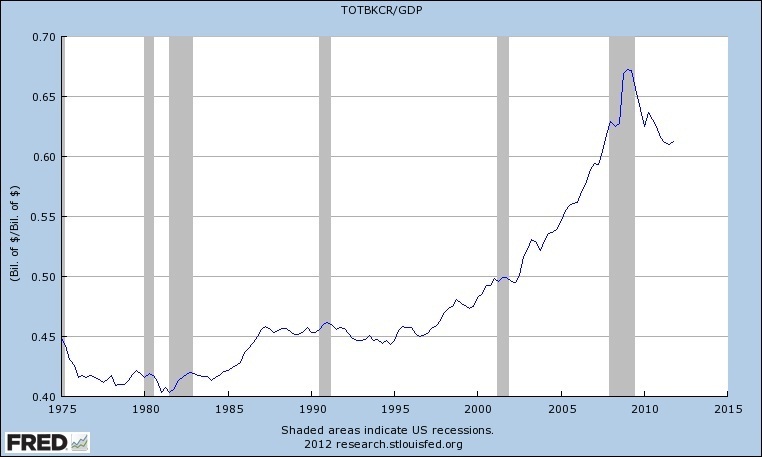 Thus, the drop coincided with the precipitous fall worldwide in financial and economic activity in late 2008 and early 2009." Here's a result of Bech's work. The horizontal axis is years; the vertical axis is the size of the FX market. The green line plots the results for 2004, 2007, and 2010 from the Triennial Survey. 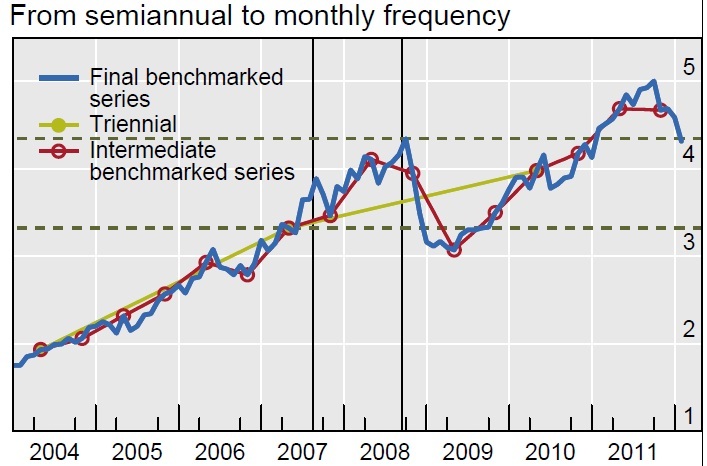 The red line uses the benchmarking technique to create a semi-annual data series, and the blue line builds on that to create a monthly data series. 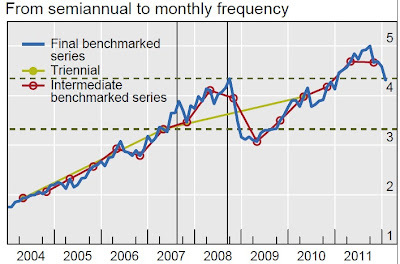 The vertical lines refer to August 9, 2007, when the first really bad news about the financial crisis hit world financial markets, and September 15, 2008, the middle of what was arguably the worst month of the crisis. facilitates trade, investments and risk-sharing across borders." In that spirit, his result interest me in several ways. First, I'm always on the lookout for ways to illustrate the effect of a global financial crisis in ways that don't involve trying to explain interest rate spreads to students. Seeing the size of the foreign exchange market contract by one-quarter or so in late 2008 and early 2009 is a useful illustration. 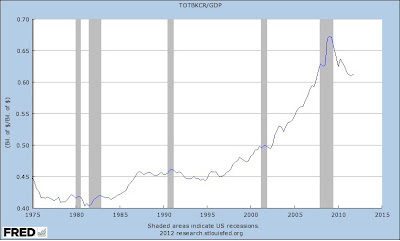 There are four more graphs for illustrating the financial crisis in this blog post of last August 3, and two more in this post of May 17. Second, it's useful to compare the size of foreign exchange markets at $4.7 trillion per day to the size of world trade. World exports were about $15 trillion for the year of 2010, according to the World Trade Organization. Thus, only a tiny part of the foreign exchange markets are involved in financing imports and exports. Instead, by far the most important part of the foreign exchange markets involves international financial investing. This insight helps to explain why FX markets are so notoriously volatile: they are a financial market where international capital markets are continually rushing in and out of currencies. The volatility suggests that those who are involved in international trade might often do well to lock in future values for foreign exchange in futures and derivatives markets--and of course, part of what makes the FX market so big is the efforts by all parties to hedge themselves against large movements in exchange rates. 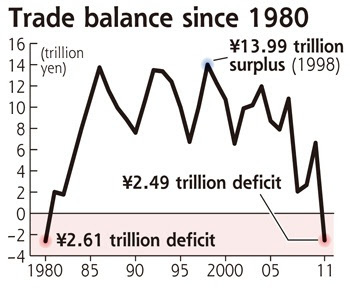 Over time, there does appear to be a tendency for foreign exchange rates to move in the general direction that reflects their purchasing power--the so-called "purchasing power parity" exchange rate. In the Fall 2004 issue of my own Journal of Economic Perspectives, Alan M. Taylor and Mark P. Taylor review "The Purchasing Power Parity Debate," and find that such movements do occur over the long-run, but they proceed slowly, over a period of several years, and in the meantime exchange rates are buffeted by changing investor sentiments and current events. Robert Allen starts off his article on "Technology and the great divergence: Global economic development since 1820" by asking a classic question: Why have low-income countries been seemingly so slow to adopt the technologies for increased production that exist in high-income countries? The article appears in the January 2012 issue of Explorations in Economic History. At least for now, Elsevier is allowing the article to be freely available here, but many academics will also have access through their libraries. progress has been biased towards raising labor productivity by increasing capital intensity. The new technology is only worth inventing and using in high wage economies. At the same time, the new technology ultimately leads to even higher wages. The upshot is an ascending spiral of progress in rich countries, but a spiral that it is not profitable for poor countries to follow because their wages are low." Simple examples of this phenomenon abound. It is cost effective to install price scanners in U.S. supermarkets, because it saves the time of cashiers, as well as purchasing and accounting workers behind the scenes. 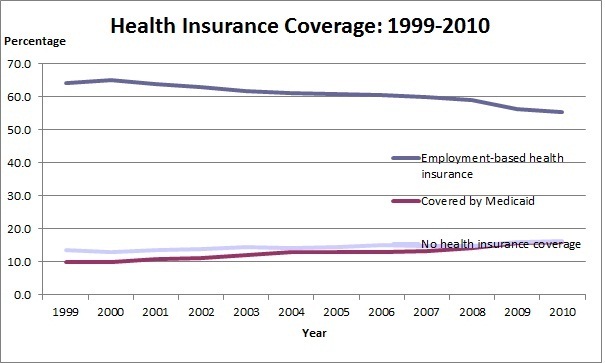 But for a low-income country with much lower wages, saving the time of workers isn't worth such an investment. Multiply this example all across the economy. 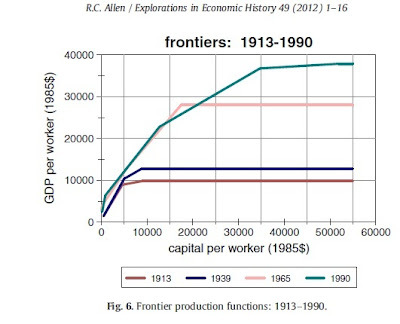 Using data on capital per worker and on GDP per worker across countries at different periods of time, Allen estimates a world production function. 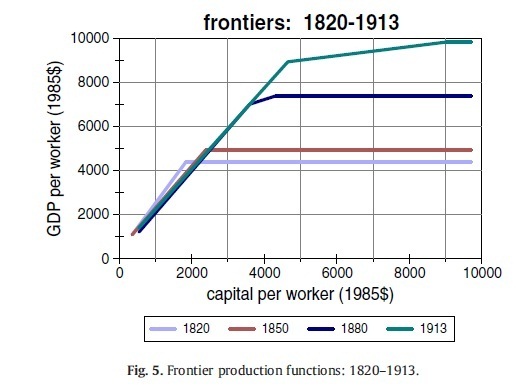 Here's is the evolution of the world production function for the period from 1820-1913, and from 1913 to 1920. These production functions display some common patterns. 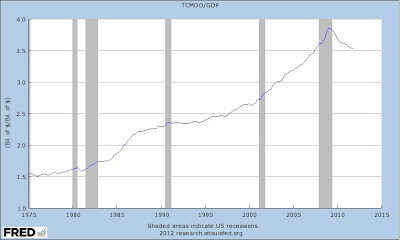 On the far left, GDP per capita rises in a more-or-less linear way with capital per worker. 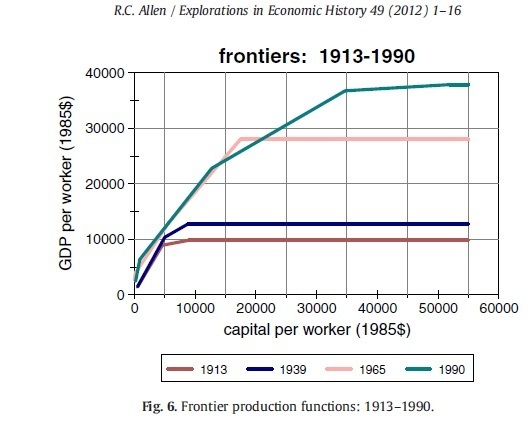 On the right, at the technological frontier, GDP per capita doesn't rise with capital per worker. Over time, the technological frontier--where the gains from additional capital per worker don't add to per capita output--keeps rising. 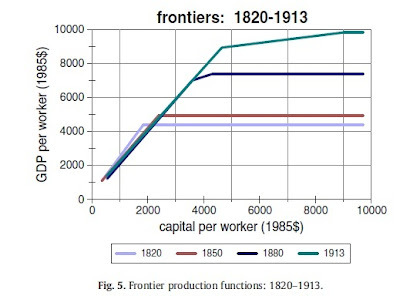 For example, the production function flattens out at about $2000 per worker in 1820, at about $4500 per worker in 1913, $17,000 per worker in 1965, and $35,000 per worker in 1990. Allen suggests that the technological leaders grow by stages, taking a generation or two to perfect the possibilities of one level of capital per worker, before then pushing further up the scale. In this perspective, technology is quite transferable between countries with roughly similar capital to worker ratios: for example, this helps to explain the convergence in per capita GDP among high-income economies in recent decades. However, low-income countries find that the technology invented by high-income countries inappropriate for their circumstances; indeed, less capital-intensive technology from 50 or 100 years ago often seems more appropriate for them. This perspective also helps to explain why a ultra-high savings rate has often been so important as a precursor to rapid growth in places like Japan in mid-twentieth-century, and then to the East Asian "tiger" economies, and then to China. High savings creates a high capital to worker ratio, and thus makes it much more possible to leapfrog forward by adopting technologies closer to the frontier. "Now something comparable is taking place in the developing world.... Emerging countries are no longer content to be sources of cheap hands and low-cost brains. Instead they too are becoming hotbeds of innovation, producing breakthroughs in everything from telecoms to carmaking to health care. They are redesigning products to reduce costs not just by 10%, but by up to 90%. They are redesigning entire business processes to do things better and faster than their rivals in the West. "Even more striking is the emerging world’s growing ability to make established products for dramatically lower costs: no-frills $3,000 cars and $300 laptops may not seem as exciting as a new iPad but they promise to change far more people’s lives. This sort of advance—dubbed “frugal innovation” by some—is not just a matter of exploiting cheap labour (though cheap labour helps). It is a matter of redesigning products and processes to cut out unnecessary costs. In India Tata created the world’s cheapest car, the Nano, by combining dozens of cost-saving tricks." This scenario suggests that in the future, technological change may not just disseminate gradually from the advanced countries to the rest of the world, as countries build up their capital/labor ratios. Instead, technological change and its effects may also be disseminating from the huge emerging markets back to consumers and firms in high-income countries. Louis Johnston writes from the College of St. Benedict at St. John's University to tell me that Robert Allen's article is also Chapter 4 of Allen's recent book Global Economic History: A Very Short Introduction (http://amzn.com/0199596654). There are two kinds of news stories about student loans. One group of stories emphasize the huge total of student loans. 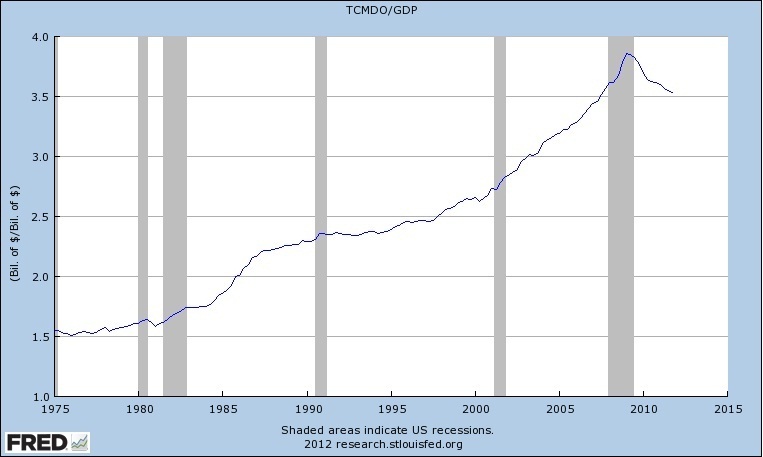 Calculations from the New York Fed for the end of 2011 find: " The outstanding student loan balance now stands at about $870 billion, surpassing the total credit card balance ($693 billion) and the total auto loan balance ($730 billion)." The Student Debt Loan Clock, which for illustrative purposes continually updates the total student loan debt outstanding, is on the verge of crossing $1 trillion. The second group of stories emphasize the problems of particular students who have large loans and great difficulties in paying them back. For example, this New York Times story tells of a New York University graduate (class of 2005) who took out more than $100,000 in loans while completing an interdisciplinary major in religious and women's studies. By 2010, she was earning $22/hour working as a photographer's assistant--and going to night school so that she could defer the loan payments. "Leaving aside extreme cases, are student borrowing levels assumed by the majority of undergraduate students consistent with their capacity to repay these loans? There is little evidence to suggest that the average burden of loan repayment relative to income has increased in recent years. The most commonly referenced benchmark is that a repayment to gross income ratio of 8 percent, which is derived broadly from mortgage underwriting, is “manageable” while other analysis such as a 2003 GAO study set the benchmark at 10 percent. To put this in perspective, an individual with $20,000 in student loans could expect a monthly payment of about $212, assuming a ten-year repayment period. In order for this payment to accrue to 10 percent of income, the student would need an annual income of about $25,456, which is certainly within the range of expected early-career wages for college graduates. Overall, the mean ratio of student loan payments to income among borrowers has held steady at between 9 and 11 percent, even as loan levels have increased over time ..."
My own guess is that part of what is happening here is that larger loan burdens are being offset by lower interest rates, so the overall ratio of loan payments to income has risen by less than one might otherwise expect. The median level of student borrowing isn't excessively high. community colleges, $6,000 for students at four-year public colleges, and $11,500 for students at private nonprofit colleges. Even at the 90th percentile, student borrowing does not exceed $40,000 outside of the for-profit sector. Examples of students who complete their undergraduate degree with more than $100,000 in debt are clearly rare: outside of the for-profit sector, less than 0.5 percent of students who received BA degrees within six years had accumulated more than $100,000 in student debt. The 90th percentile of degree recipients starting at for-profits have $100,000 in debt; so a nontrivial number of students at for-profits accumulate this much debt, but the situation is still far from the norm." Students thinking about loans should also think seriously about their risk of not finishing a degree--especially at for-profit and less selective institutions. college category, with more-selective colleges typically having higher graduation rates." What are the average employment and wage prospects for your planned major? Students considering loans should think about the typical employment and pay prospects for that major. I do think that many students agonize a little too much over their major, while not agonizing enough over the extent to which they are building a skill set. That said, different majors have different payoffs. Avery and Turner offer some evidence on this point, and in this post of January 11, 2012, I discuss some basic evidence on "For What Majors Does College Pay Off?" In that post, I summarized it this way: "[W]hen looking at unemployment rates, along with the architects, those who majored in humanities or in in the arts have relatively high rates, while those who had majored in health and education had relatively low unemployment rates. When it comes to income, the highest income levels are for those who majored engineering, computer science/mathematics, life sciences, social sciences, and business. The lower income went to those majoring in arts, education, and psychology/social work. Students considering loans should consider that any major leads to a widely dispersed range of employment and pay outcomes. When you look at pay out of college, there is considerable inequality--and the range of inequality has been generally increasing over the last couple of decades. Thus, the median pay is a better guide to expectations than the average. Especially if you have been a middle-range or lower-middle-range student all through high school, it would be unwise to assume that you are likely to be at the top of the income range after graduation. Students should look to their high school experience for some guidance as to how they will fare in college. About 60% of high school students go on to college. For the purposes of a quick-and-dirty estimate, let's say that it's the top 60% by academic qualifications. Thus, if you are at, say, the 70th percentile of your high school class, you are in the middle of those going on to college. Given that many of those who go on to college don't finish a degree, being at the 70th percentile of your high school class may mean that you can expect to be ranked in the bottom quarter of those who complete a college degree. Sure, some students will improve dramatically from high school to college, but it's a statistical fact that half of college graduates will be below the median, and one-fourth will be in the bottom quarter, and especially if you are advising a large number of high school students, it's unrealistic to tell each of them that that they can all end up in the upper part of the college distribution. Some students borrow too little: for example, they don't take advantage of the the subsidy implicit in the student loans for which they are eligible, or they run large credit-card debts when it would be much cheaper to use student loans to borrow. not borrowed from the Stafford loan program. Carrying credit card debt without maximizing Stafford borrowing burdens students with unnecessarily inflated interest rates—a choice that can interfere with a student’s ability to finish a degree." In addition, there are a number of students working more than 20 hours per week, and at least some of them might have a better chance of finishing their degree if they borrowed more and didn't try to work many hours. Clearly, some of this advice would, if taken seriously, discourage some students from taking out loans to attend college. Given the price of higher education, I think that hard choice needs to be faced. Several decades ago, it was a low-risk option to spend a few years working part-time and attending a big public university: if it didn't end up in a degree, at least you didn't rack up much or perhaps anything at all in loans and you could learn something and have a good time and grow up a little along the way. But at current prices, that part-time job won't pay the higher education bills at most institutions. Sending a message that all students should try a few years of college, even if it requires taking on tens of thousands of dollars in loans, is borderline irresponsible. Are you attending a college--especially a for-profit--with a high drop-out rate? Are you planning on a major (or a set of classes that will build real skills) so that you have good employment prospects? How strong is your personal motivation for attending classes and finishing a degree? Does your high school class ranking give you reason to believe that you have the ability to succeed? If your higher education experience doesn't turn out as you hope, and you don't finish the degree, or you don't end up with a job that pays substantially less with the median in your field, will you feel OK with the loans you have taken out? Are you taking out an average amount of loans, so that you will be committing no more than about 10% of your income to repaying them? Given the growing wage gap between those with a college degree and those without, it will make economic sense for lots of students to borrow, especially at today's rock-bottom interest rates. But with student loans, we're talking about young adults often in their late teens and early 20s making financial decisions that could be with them for decades to come. It's a transaction that should be made with caution and consideration. As Mahmoud Elamin and William Bednar of the Cleveland Fed point out: "Structured finance has been vilifi ed as the culprit behind the worst recession since the Great Depression. Every aspect of its design has been disparaged: faulty underlying loans, bad incentives for originators, dubious AAA ratings and mispriced risks." In the March 2012 issue of Economic Trends, Cleveland Federal Reserve, they update the story by asking: "How Is Structured Finance Doing?" such as credit card loans, auto loans, student loans, and the like, while CDO are backed by investment grade loans, high-yield loans, other structured finance products, and the like." What happened in each of these three categories? In the first category, the mortgage market, the total value of mortgage originations dropped off after about 2003. However, the share mortgage originations that were packaged as securities has continued to rise. Here are a couple of illustrative figures. Why has the share of mortgages packaged as securities continued to rise? Elamin and Bednar name three possible reasons, but don't try to quantify them: a rise in private demand for such instruments, polices of government-sponsored enterprises like Fannie Mae and Freddie Mac, and the Federal Reserve "quantitative easing" policies, which have involved direct purchase of about a $1 trillion in mortgage-backed securities. The second broad category of securitized finance is asset-backed securities. The biggest categories here are securities backed by auto loans and by credit card loans, with securities backed by student loans as another large category. Issuance of asset-backed securities dropped off by about half after 2006. In addition, the share of total auto-loan debt that is securities fell from above 40% to 30%, while the share of credit card debt repackaged as asset-backed securities fell from more than 30% to around 15%. The third category is collateralized debt obligations. This is the category of structured finance most thoroughly implicated in the housing price bubble. Issuance of these securities rose from less than $100 billion in 2003 to about $500 billion in both 2006 and 2007, at the peak of the housing bubble, and since has fallen to near-zero. In addition, these collateralized debt obligations at the peak were largely based on mortgages, especially subprime mortgages. These were the financial instruments that started off with subprime mortgages, and then were divided into tranches. The junior tranches agreed to take the first of any losses that arose. Thus, the senior tranches--seemingly protected by the junior tranches--managed to get AAA credit ratings, and thus regulators let banks hold these "safe assets." When the housing bubble burst, and many of these subprime mortgages went sour, the popping of the housing market bubble had leaked into the banking system. Today, CDOs aren't based on housing; instead, what remains of the market is main involve securitizing investment-grade bonds and high-yield loans.